Beautifully engraved RARE stock certificate from the E. F. Hutton & Company Inc. printed in 1972. 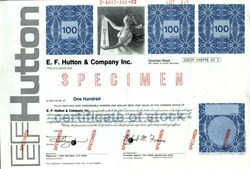 This historic document was printed by the American Banknote Company and has an ornate border around it with a vignette of a woman holding up a E.F. Hutton sign. This item has the printed signatures of the Company�s President and Secretary and is over 43 years old. 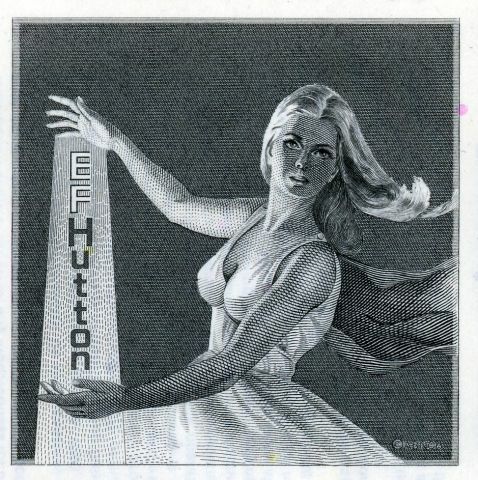 E. F. Hutton & Co. was an American stock brokerage firm founded in 1904 by Edward Francis Hutton, his brother Franklyn Laws Hutton, and Gerald M. Loeb. Under their leadership, it became one of the most respected financial firms in the United States and for several decades was the second largest brokerage firm in the United States. The firm was best known for its commercials in the 1970s and 1980s based on the phrase, "When E. F. Hutton talks, people listen" (which usually involved a young professional remarking at a dinner party that his broker was E.F. Hutton, which caused the moderately loud party to stop all conversation to listen to him). Hutton was one of the first brokerages to open offices in California. It also operated seasonal offices in Florida (winter) and New York state (summer) to cater to its customers. Edward Hutton led the firm until his death in 1962. By the early 1980s, the brokerage house he founded had become the principal component of what grew into a conglomerate of companies owned by E. F. Hutton Group Inc., listed on the New York Stock Exchange. Other subsidiaries of that Delaware-chartered holding company were E. F. Hutton Trust Company (now "Smith Barney Corporate Trust Company" and owned by Citigroup), E. F. Hutton Life Insurance Company, and E. F. Hutton Bank. The Hutton companies also managed many mutual funds and other investment vehicles, some of which were separately incorporated and/or registered, and participated actively in corporate mergers and public offerings of securities. In 1980, several Hutton branches began writing checks greater than what they had on hand at one bank, then making a deposit in another bank equal to the amount it wrote at the first bank. This strategy, known as "chaining," is a form of check kiting. "Chaining" gave Hutton the use of money in both accounts until the checks cleared. In effect, Hutton was giving itself a free loan that also didn't carry any interest. Thomas Morley, who was in charge of getting the firm to better manage its cash, wrote a memo to Hutton's president, George Ball, saying that this practice netted one branch an extra $30,000 per month. Ball sent the memo out across Hutton's network of regional sales managers, with the note, "A point well remembered�and acting on." Over the years, Hutton shuffled money in this manner between 400 banks (mostly small rural banks), gaining the use of an estimated $250 million a day without paying a penny in interest. Whenever something was amiss, Hutton questioned the bank's procedures. The scheme worked for almost three years until officials at the Genesee County Bank in Batavia, New York, discovered that the large deposits made by Hutton's four-person office there were far more than the office's banking requirements. They also discovered that the checks Hutton was using to make the deposits were drawn on two Pennsylvania banks. When Genesee officials learned that Hutton didn't have enough money in the Pennsylvania bank accounts to cover the checks, they stopped honoring Hutton checks. One of the banks involved, United Penn Bank (now part of Citizens Financial Group), asked the Federal Deposit Insurance Corporation to investigate. In 1984, the matter was forwarded to the United States Attorney for the Middle District of Pennsylvania, who opened a federal criminal probe. Hutton retained Tom Curnin, a respected defense attorney who was inclined to fight the government. However, in February 1985, Curnin discovered a memo from a Hutton regional vice president for the Washington, D.C., area which stated that his offices drew on "bogus deposits." The memo�tantamount to a smoking gun�led Curnin to change tactics and begin negotiations for a plea agreement. In the spring of 1985, Curnin told Hutton's board that it faced two choices: plead guilty to a massive list of felonies or face a trial that would likely see three senior Hutton executives convicted and drive Hutton out of business. Curnin advised settling with the government to avoid years of bad publicity. On May 2, Hutton agreed to plead guilty to 2,000 counts of mail and wire fraud, as well as pay a $2 million fine plus $750,000 for the cost of the investigation. Hutton also agreed to pay $8 million in restitution�the estimated extra income earned from the fraud. In return, Curnin wrung two major concessions. First, no Hutton executives would be prosecuted (even though the government determined that 25 senior officers masterminded the scheme). Second, the Securities and Exchange Commission allowed Hutton to stay in business; guilty pleas of this magnitude usually result in an individual or firm being permanently barred from the securities industry. An internal review conducted by former Attorney General Griffin Bell concluded that the scam occurred due to inadequate internal controls. For example, no one admitted to being Morley's immediate supervisor. However, a wide perception that Hutton hadn't been punished enough (for example, the New York Times' William Safire claimed that a $2.75 million fine for a "bank heist of this size is like putting a parking ticket on the Brink's getaway car"), led several customers to pull their accounts with Hutton, and many of the firm's star performers fled to other firms. Several public agencies also took their business elsewhere. In early 1987, an internal probe revealed that brokers at an office in Providence, Rhode Island, laundered money for the Patriarca crime family. Although Hutton reported the investigation to the SEC, it wasn't enough to stop prosecutors from all but announcing that Hutton would be indicted. In a case of especially bad timing, this came only a week before the 1987 stock market crash. By the end of November, Hutton had lost $76 million, largely due to massive trading losses and margin calls that its customers couldn't meet. It also had its commercial paper rating cut from A-2 to A-3, effectively losing $1.3 million in financing. Hutton was now weeks�perhaps days, according to some board members�from collapse. On December 3, Hutton agreed to a merger with Shearson Lehman Brothers. The merger took effect in 1988, and the merged firm was named Shearson Lehman Hutton, Inc. It later emerged that Hutton had faced massive cash shorts as early as 1985, and the firm's management had tried to put it up for sale as early as 1986. In 1993, American Express sold its brokerage and asset management business�the Shearson and Hutton parts of Shearson Lehman Hutton�to Primerica. Primerica merged them with Smith Barney (which it had bought in 1987) to form Smith Barney Shearson, later shortened back to simply Smith Barney. As a result of several mergers over the rest of the decade, the remains of E.F. Hutton are now part of Citigroup.